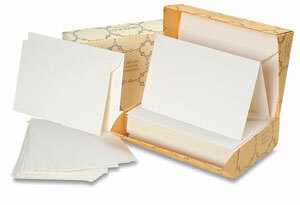 Fabriano's best-selling Medioevalis sizes are now available in combined card and envelope sets! Crafted in Italy by the Fabriano mill, this soft, white, deckle-edge stationery lends a distinctive flair to invitations, announcements, quick notes, or a heartfelt thank you. The luxuriously soft feel of this mouldmade paper is the perfect surface for pen, pencil, charcoal, pastel, light washes, stamping, rubbings, stenciling, printmaking, letterpress, and inkjet printing. It's also an excellent paper for making books. Distinctive, traditional Italian packaging. Fabriano Medioevalis Stationery Sets contain 20 cards and 20 envelopes each. The cards are 260 gsm and the envelopes are 120 gsm.